Was seen right away. Prompt diagnosis. The doctor went out of his way to provide me with samples so I didn'tneed to go to the pharmacy for a short-term condition. He even helped with an additional service (trimming nails) that others often charge extra for. Quick, easy, very productive visit! Was seen right away. Prompt diagnosis. The doctor went out of his way to provide me with samples so I didn't need to go to the pharmacy for a short-term condition.He even helped with an additional service (trimming nails) that others often charge extra for. Quick, easy, very productive visit! Excellent. Beautiful office, friendly staff. 1-2-3 appt. dr. Was able to diagnose right away and give a solution in office.Love not wasting my time. Definitely my new podiatrist from now on. Excellent. Beautiful office, friendly staff. 1-2-3 appt. dr. Was able to diagnose right away and give a solution in office. Love not wasting my time. Definitely my new podiatrist fromnow on. Evan A. Vieira is a diligent and skilled podiatrist serving the communities of Manhasset and Huntington, NY. Dr. Vieira attended the New York College of Podiatric Medicine, where he received his podiatric degree, and completed his residency at North Shore University Hospital, Long Island Jewish Medical Center. He also holds a bachelor’s degree from Syracuse University. 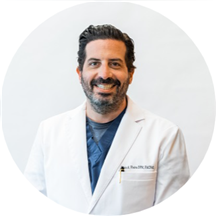 Dr. Vieira is a part of Advanced Podiatry and is affiliated with Long Island Jewish Medical Center in New Hyde Park, NY and North Shore University Hospital in Manhasset, NY. He is board certified in Reconstructive Rearfoot / Ankle Surgery and Podiatric Surgery and is a member of the American College of Foot and Ankle Surgeons. Because Dr. Vieira's staff is blingual in English and Spanish, patients from a variety of backgrounds enjoy having him as their physician. Patients trust Dr. Vieira’s expertise because he consistently provides high quality care that leads to positive and lasting health outcomes. This review is long overdue. I had my consultation and was scheduled for surgery with Dr Vieira. From the initial visit to the surgery day to all the follow-ups, everything was super smooth. The staff at each location (so easy tomake an appointment at each) and the surgery center were very nice, efficient, and caring. Dr Vieira is not only a skilled doc and surgeon, but he also truly cares about his patients. I am very happy with everything and I definitely made the right choice. Thank you, Dr Vieira! Professional and attentive, his nurse was the nicest person too - excellent experience ! The visit was very quick, though efficient and thorough. Looking forward to my follow-up visit! Very easy to make an appt., clean office, plenty of parking, great professional staff! Was seen right away. Dr Vieria was very knowledgeable, patient, professional, and explained things very well. I feel very confident in moving forward with him. Thank you dr vieria ! Fantastic visit! Efficient and very well spoken about explaining procedure! Professional! Made me feel comfortable since I was a little nervous and explained everything to me along it's his assistant who was great too. Dr. Vieira is the best Podiatrist that I have met. He was so accurate with his quick diagnosis, solution and follow up. Very positive experience. Dr. Vieira and his assistant were prompt, friendly, and willing to take time to answer my questions in a clear way. I will definitely continue to see Dr. Vieira for future podiatry issues.